Narrow web label printing system leader Afinia Label will be showing their latest printers, finishers, and applicator at Graphics of the Americas in Miami, FL from February 18–20 in booth 1125. Their show line-up will include the L801 Color Label Printer, Epson ColorWorks C7500 Inkjet Label Printer, DLP-2000 Digital Label Press, DLF-1000 Digital Label Finisher, and their newest product, the A300 Label Applicator. Afinia’s complete range of affordable, fast, high-quality digital label printing and finishing systems offer a great option for companies who want to take control of their labeling. The Afinia Label L801 is powered by Memjet technology, which gives it a print speed of 60 feet per minute and an industry-leading low ink cost of less than 3 cents for a typical 4” x 6” label with 75% coverage. This is a fraction of the cost of other inkjet label printers. The L801 supports 3 print modes: Roll to Roll, Roll to Cut, and Print & Present. Epson’s ColorWorks C7500 inkjet printer allows businesses to dramatically reduce label costs, increase operational efficiencies and quickly produce high-quality, durable, full-color labels. It is ideal for high-mix, low-volume applications and features print speeds up to 12 inches/second. 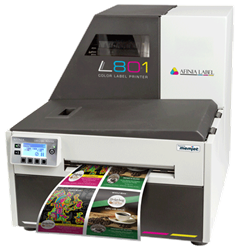 The Afinia Label DLP-2000 Digital Label Press includes, and works inline with, the Afinia Label L801 to print, laminate, die-cut, remove matrix, and roll labels. The DLP-2000’s rotary die-cutting system creates finished label rolls with uncompromised backing. These labels are very reliable when used with inline label applicators and avoid line stoppages caused by punctured backing.